Data backup is a mechanism to replicate essential data from primary storage to a secondary storage device. It is mainly used to prevent data loss in the case of the primary storage device failure or loss. The failure or loss can be due to many reasons such as media failure, theft or hardware damage. Data backup is essential to prevent the loss of hard to reproduce data or non reproducible data. It is mainly used to safeguard against theft or accidental loss. There are many data backup methods. The best data backup for a system depends on the system's intended use, size and complexity. The most advanced backup techniques are mostly deployed by financial institutions, airline reservation systems, national archives and many other data sensitive systems. The most basic data backup is a single user computer backup. For the average user the following data backup methods can be used. Attached Storage Backup is the most simple form of backup and the most affordable. It consists of connecting a hard drive directly to the backup source and performing a system backup. The backup hard drive usually connects through USB cable and system backup is initiated through backup software installed on the source computer. The advantages of this type of backup is the low cost and ease of setup. The main disadvantage to this method relies in the fact that the source and the destination are in the same physical location. Another disadvantage when backing up multiple computer is having to attach an external to each computer resulting in efficiency reduction and possible data scattering on different drives..
Network Attached Storage Backup (NAS) is a more reliable backup solution. It consists of a remote backup to a local network attached storage device. 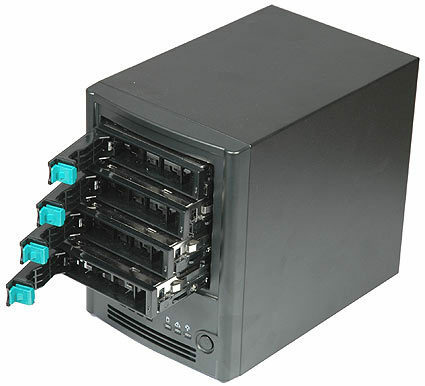 For this solution the source computers and the NAS must be on the same network. The NAS is used as a networked drive that is visible to all the computers on the network and backup software can remotely back up without the user intervention. The advantages of this solution are many. The most obvious advantage is the ability to access the data from any device on the network and backup all devices to a central storage. The other advantage is the flexibility offered by the solution where the storage can be increased based on need. The NAS can also be used as a media server and file sharing. The disadvantages are increased costs and additional network setup. Also the throughput can be limited to 1GB/s if a 1GB Ethernet network is used. Please follow the link to see our network attached backup solution. Online Backup is the newest form of backup and consists of storing a copy of your files at a remote location that is provided by a third party. This solution sends your data over the internet to a backup service provider. There is no hardware costs associated with online backup as the destination hardware is provided by your backup service provider. The costs are a monthly fee that can be variable depending on the data backup size. The advantages of this solution are simplicity and data protection against most disasters. The disadvantages are many, the main disadvantage is associated with the data ownership and the privacy issue. While the user owns the data, it is stored on a third party farm server that cannot be easily tracked. Plus it can be located outside the country of origin where privacy rules are not preserved. There are many other technical issues that can be also identified such as the data transfer speed which makes backing up system images costly in terms of time and increased costs due to large image size.